Feel your heart race and your mind clear as you dog sled through the pristine wilderness of the Canadian Rockies just outside Canmore near the Banff National Park and Kananaskis Country. 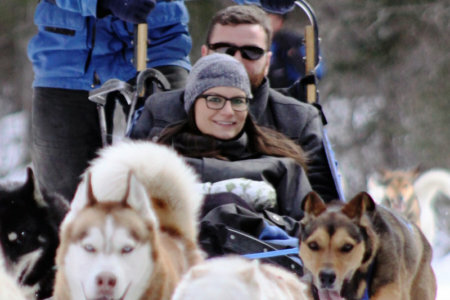 Experience a dog sledding adventure you will never forget! For those travelling to Banff, Canmore or Kananaskis Country, Howling Dog Tours caters to the romantic, the adventurer, the thrill-seeker, the young and old alike. Our flexibility is unmatched because of our vast Western Canadian experience in both touring and dog sled racing. ...experience the serenity of nature as our dogs take you on a comfortable yet exhilarating tour. ...seeking unparalleled thrills, Howling Dog Tours can fulfill your dreams in a way that only an experienced racing kennel such as ours can do. We believe that everyone should experience the thrill of a dog sled racing team and the pristine beauty of the Canadian Rockies. Learn why our Canmore / Banff sled dog tours are unmatched for safety, service & price in the Bow Valley.